The race is on to become a digital enterprise. Every organization has a plan for updating products, technologies, and business processes. But that's not enough anymore. With disruptive startups outperforming industry stalwarts, executives everywhere are pushing greater growth and innovation. Staying competitive demands a complete digital transformation. For professionals charged with leading technology-driven change, the pressure is intense-and the path forward unclear. 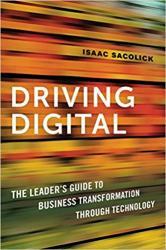 Author Isaac Sacolick has successfully spearheaded multiple transformations and helped shape digital-business best practices. Now in Driving Digital, he shares the lessons he's learned, detailing how to: Formulate a digital strategy * Transform business and IT practices * Align Development and Operations * Promote agile practices * Drive culture change * Bolster digital talent * Manage a portfolio of initiatives * Capture and track ROI * Strengthen data-driven decision making and expand data science practices * Cultivate strategic technology capabilities * Develop innovative digital products * Enable product management * Pilot emerging technologies * Become smarter faster. Every company is on the cusp of digital disruption. But with so many pieces to the puzzle, efforts often get derailed. Driving Digital is the action plan you need to take your company and career into the future.